I started this series of rings as part of the Ring a Day project, though the original impulse came from my college project - on letter and script. 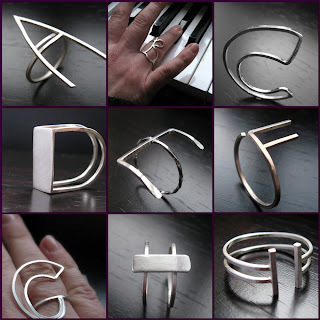 My idea was to take simple letter outlines and make them into wearable, interesting, rings. I've designed them using capital letters and used square silver wire for a clean line and modern paired down look. The results so far are pictured here. At the moment I'm making them to order, so if you fancy your initial or want to spell out rude words on your fingers, just get in touch! How do you do it? You are a fountain of inspiration! Sue, you don't blog enough! I've been foloowing your RAD on flickr and so impressed with all your creativity, I would totally have fallen off the wagon by now. This is such a great idea. I love the notion of working on new things to "expand" perceptions.